U.S. health officials call on vaping industry to address rof isk having their flavoured products pulled off the market. U.S. health officials are sounding the alarm about rising teenage use of e-cigarettes, calling the problem an "epidemic" and ordering manufacturers to reverse the trend or risk having their flavoured vaping products pulled from the market. 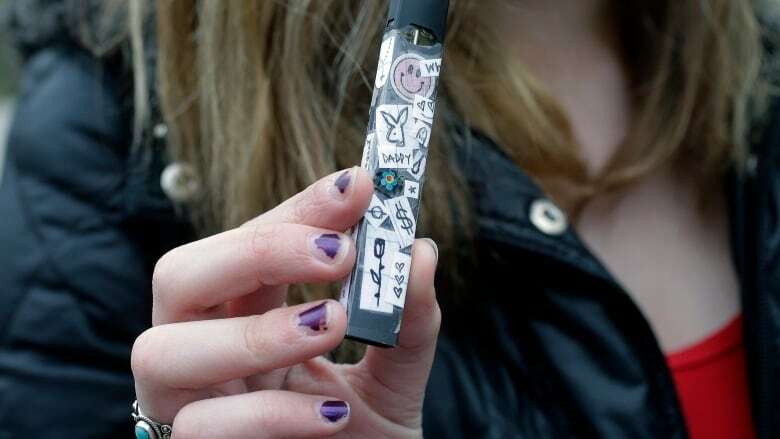 The warning from the U.S. Food and Drug Administration on Wednesday cited recent data that points to a sharp increase in underage use of the handheld nicotine products, including Juul and others. But Gottlieb said in an address at FDA headquarters that he failed to predict the current "epidemic of addiction" among youth, mainly driven by flavoured products. E-cigarettes are vapour-emitting devices that have grown into a multi-billion dollar industry in the U.S. despite little research on their long-term effects, including whether they are helpful in helping smokers quit. They're generally considered a less dangerous alternative to regular cigarettes. But health officials have warned nicotine in e-cigarettes is harmful to developing brains. They typically contain nicotine, and sometimes flavourings like fruit, mint or chocolate. In June, a government survey found teen vaping seemed to be holding steady last year. Some experts were cautious about the results, however. They noted the survey did not ask specifically about Juul, a sleek, heavily-marketed e-cigarette brand that exploded onto the market and accounts for 70 per cent of U.S. sales, according to analyst estimates. Under regulations developed by the Obama administration, manufacturers were supposed to submit most products for review by August 2018. But last year Gottlieb said he would delay the deadline until 2022. He said both the agency and industry needed more time to prepare. The decision was criticized by anti-smoking advocates who say e-cigarette makers are targeting kids with candy and fruit flavours and aggressive marketing. Under Wednesday's announcement, the five largest e-cigarette manufacturers will have 60 days to produce plans to reverse underage use of their products. The companies sell Vuse, Blu, Juul, MarkTen XL, and Logic e-cigarette brands, which account for 97 per cent of U.S. e-cigarette sales, according to FDA. San Francisco-based Juul said it is working to prevent underage use of its products but added that flavours can help adult smokers quit cigarettes. Last month, Juul Labs announced it's coming to Canada. In most provinces, there are restrictions on how vaping products can be sold and where they can be used. Gottlieb criticized e-cigarette companies' handling of underage use of their products, saying they approached it as "a public relations challenge rather than seriously considering their legal obligations." This week, researchers also said nicotine and other chemicals exhaled by e-cigarette smokers can move through air vents, leaving residue on surfaces in other locations. Scientists tracked e-cigarette chemicals from a vape shop and found the residue in a business next door at a California mall. "Unlike cigarette smoking, we do not yet know the long-term health effects of e-cigarette use and passive use," said Kareen Khachatoorian of the University of California at Riverside, who led the study.